Give me a lotto winner’s check book and I can give you a magnificent red blend. Trim the winnings down to under $19 and I can still do that with several very enjoyable white wines. Trim off a little more and insist I do that again but now with red wine and the options narrow into the challenging lane. To narrow the lane even more and add a speed bump, insist also that the wine be ageable and classically made and then the options lead surprisingly not into a lane at your specialty liquor store, but instead to the checkout lane at your local grocery. People that have been around wine for decades, have learned through experience that price is not always indicative of quality and that bargains are fermented under the radar so to speak. The most recent issue (Jan – Feb 2016) of Wine Spectator, for example, stated (page 84) that the average price for a wine awarded 90 or more points in 2015 was $100 in France, $82 in California and $71 in Italy. There are numerous reasons for this that I’ll forego mentioning in this piece and save, perhaps, for another time. Let’s accept that most of us aren’t inclined to spend even $71 on a bottle of wine to accompany our family’s prepared-at-home meal whose ingredients cost $15. So being able to find a bottle of red wine that is delicious, affordable and available at the same grocery store you’re shopping at for that meal seems, to me, a real bonus. Palazzo della Torre (IGT) is an Italian red blend of 70% Corvina, 25% Rondinella and 5% Sangiovese. The vineyard is in the Fumane (municipality) di Valpolicella in Verona (Northern Italy). This is the same area famous for producing Valpolicella Superiore and the more expensive Valpolicella della Amarone wines. Vines for Palazzo della Torre average 41 years and this wine produced by Allegrini shares some characteristics with these expensive cousins in using both Corvina and Rondinella grapes in the blend and, by the way, in percentages allowed in making an Amarone. Of course, there are differences. One being price. Palazzo della Torre dries only a small percentage of the grapes (about 30%) before they are mixed with the base juice (grapes not dried) and then subject to a second fermentation. (For more on the process of drying grapes (appassimento) click here. The Corvina contributes structure and aroma. Rondinella is naturally high in sugar, also shrivels nicely and contributes both sweetness and body with mouth texture. Sangiovese contributes floral aromas and flavor notes of cherry. This is a wine of depth, deep purple in the glass, with flavor to match: fruit is creamy rich and deep with a silky mouthfeel (malolactic fermentation) and full bodied. Flavors are of ripe blackberry, cherry-cola with mocha on the back taste and with a hint of nutmeg. Aromas of blackberry and chocolaty plum jump. It has a medium finish that is off-dry with some tannin on the end but with a sensation of sweetness. This dry-sweet interplay is always enjoyable; common in wines fermented with dried grapes. Wines of this composition are often somewhat low in acid but Palazzo della Torre can be aged ten years under optimum conditions. 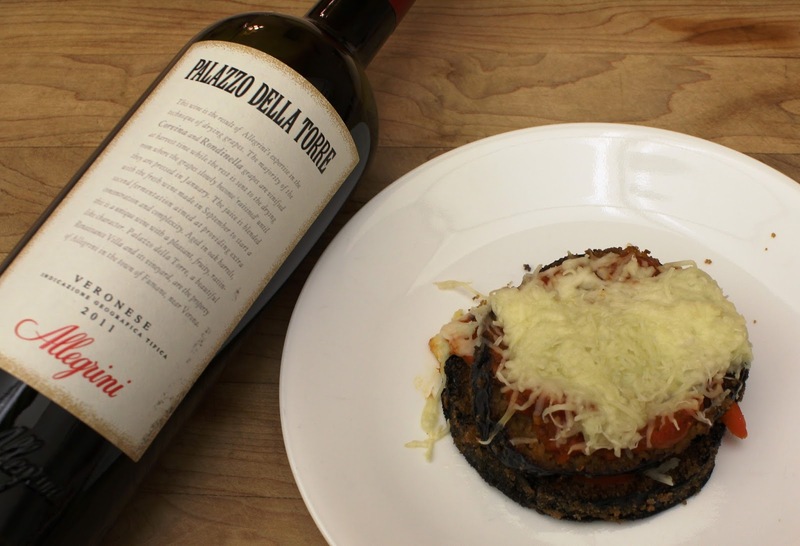 Referring to the above prices ($71) and point ratings (90 and above), this 2011 Palazzo Della Torre scored 90 points from Robert Parker, 90 points from Wine Enthusiast and 92 points from James Suckling. And I found it stocked at a local grocery for $16.99. Referring to the quote this post opened with, Palazzo della Torre is a bottle that will be finished once opened, not just tasted. Pair this wine with lasagna, eggplant parmigiana, risotto with saffron, medium cured cheeses, pork sauced with mushroom. Try it with an Italian style charcuterie of cured sausage, Parma ham, cheeses (gorgonzola, pecorino, Parmesan Reggiano) and walnuts. Like Wine Mizer on FaceBook for fun facts and quizzes, short reviews of wine, industry news and recipes to pair with your wine. Manual harvest is during the first week of September for grapes to be set aside for drying; end of September for grapes to be vinified immediately. Fresh grapes are de-stemmed and pressed in September; dried grapes in the second half of December. Fermentation is in temperature controlled stainless steel tanks. The first fermentation is at 77-84F for 10 days; the second at 46-72F approximately 15 days. Malolactic fermentation is in mid-April in barriques (59 U.S. gallons). Ageing is 15 months in second use oak barriques, blended together for two months and then bottle aged an additional seven months before release.